A Web designer is one of the persons without whom it is not possible to create a site. 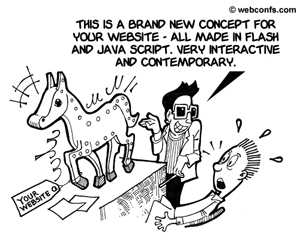 However, when SEO is concerned, Web designers can be really painful to deal with. While there are many Web designers, who are SEO-proficient, it is still not an exception to stumble upon design geniuses, who are focused only on the graphic aspect of the site. For them SEO is none of their business and they couldn’t care less for something as unimportant as good rankings with search engines. Needless to say, if you hire such a designer, don’t expect that your site will rank well with search engines. If you will do SEO on your own, then you might not care a lot about the SEO skills of your Web designer but still there are design issues as we’ll see next, which can affect your rankings very badly. 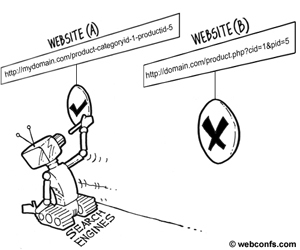 When he or she designs the site against SEO rules, then it is not possible to fix this with SEO tricks. When we say that you need to hire a SEO-friendly designer, we presume that you are a SEO pro and you know SEO but if you aren’t, then have a look at the SEO Tutorial and the SEO Checklist. If you have no idea about SEO, then you will hardly be able to select a SEO-friendly designer because you won’t know what to look for. One of the ultimate tests if a designer is SEO-friendly or not is to look at his or her past sites – are they done professionally, especially in the SEO department. If their past sites don’t exhibit blatant SEO mistakes, such as the ones we’ll list in a second and they rank well, this is a recommendation that this person is worth hiring. Anyway, after you look at past sites, ask the designer if he or she did the SEO for their past sites because in some cases it might be that the client himself or herself has done a lot to optimize the site and this is why the site ranks well. Many designers still believe that Flash is the next best thing after sliced bread. While Flash can be very artistic and make a site look cool (and load forever in the browser), heavily Flash-ed sites are disaster in terms of SEO. Simple HTML sites rank better with search engines and as we point out in Optimizing Flash Sites, if the use of Flash is a must, then an HTML version of the same page is more than mandatory. Internal links are backlinks and they are very important. Of course, this doesn’t mean that all the text on a page must be hyperlinked to all the other pages on the site but if there are only a couple of internal links a page, this is a missed chance to get backlinks. This is another frequent mistake many designers make. Anchor text is vital in SEO and when your links lack anchor text, this is bad. It is true that for menu items and other page elements, it is much easier to use an image than text because with text you can never be sure it will display correctly on users’ screens, but since this is impacting your site’s rankings in a negative way, you should sacrifice beauty for functionality. If you have no idea about HTML, then it might be impossible for you to judge if a site’s code is messy and if the amount of code is excessive but cleanness of code is an important criterion for SEO. 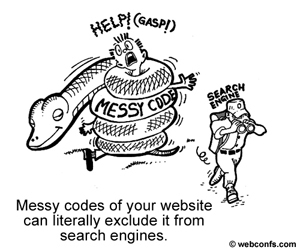 When the code is messy, it might not be spiderable at all and this can literally exclude your site from search engines because they won’t be able to index it. Overoptimized sites aren’t better than under-optimized. In fact, they could be much worse because when you keyword stuff and use other techniques (even when they are not Black Hat SEO) to artificially inflate the rankings of the site, this could get you banned from search engines and this is the worst that can happen to a site. Well, maybe dynamic URLs is not exactly a design issue but if you are getting a turn-key site – i.e. it is not up to you to upload and configure it and to create the links inside – then dynamic URLs are bad and you have to ask the designer/developer not to use them. You can rewrite dynamic and other SEO non-friendly URLs on your own but actually this means to make dramatic changes to the site and this is hardly the point of hiring a designer.